Ace Metrix®, the leader in measuring the impact of video advertising, released the 25 most-liked Super Bowl ads of the last five years. The last five years is relevant because brands have been more aware of social video channels as part of its reach. Ace Metrix claims that "the number of ads released ahead of time, either on social media or through teasers, has gone from 8 percent in 2011 to 61 percent in 2015." This is evendenced as we were able to embed each video you see below. Budweiser dominates the list, producing six of the top ads, including the top three overall. This list uses Likeability as the measure which is like the Nielsen "likeability index" -- the number of people who liked an ad they saw and can remember the brand. 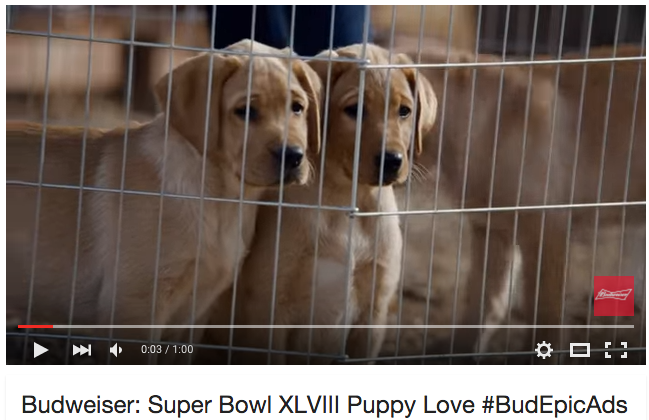 Led by its 2014 60-second “Puppy Love” ad with a Likeability score of 8311, the brand’s 2013 “Brotherhood” (804) and 2015 “Lost Dog” (802) closely follow. This list below is by rank, brand, title and (likeability). Check it out.